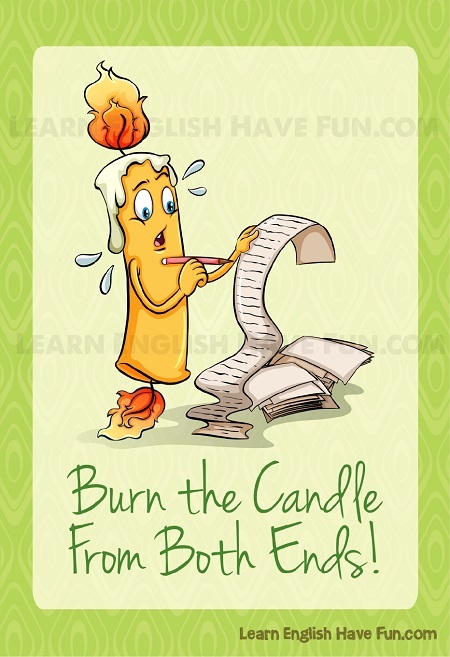 Look at the picture and try to guess the meaning of the idiom 'burn the candle from both ends.' This is a common American English idiom so it's important to learn it. Burn the candle at / from both ends: To become exhausted from staying up very late and getting up very early because you're busy doing many things or working a lot. 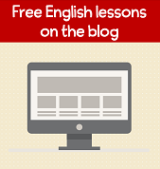 Here's a way to try to remember this idiom. If you think of the days when there wasn't electricity and people worked by candlelight you can imagine someone using one end of the candle to work at night and the burning the other end of the candle early in the morning. The result is that the person is exhausted from working a lot and getting little sleep. You can say "burn the candle at both ends" or "burn the candle from both ends." My wife's been burning the candle from both ends for two months now and she about to get seriously ill as a result. I quit my job at the law firm because I developed high blood pressure from always burning the candle at both ends. I can't take the stress any more—I've been burning the candle from both ends since I started graduate school. My boyfriend was working from 8am -10pm for eight months and finally I told him if he continued to burn the candle at both ends I'd have to break-up with him. My son slept 34 hours straight when he got home last week. I guess he burned the candle at both ends during exam week. I work at a retail store and during the Christmas holidays everyone is forced to burn the candle from both ends. During midterm examinations all the students burn the candle at both ends. If you keep burning the candle at both ends you will end up with high blood pressure or some awful health problem. Time to practice your English — practicing by creating your own sentence will help you remember this idiom in the future. When was the last time you burned the candle at both ends? Do you know anyone who is burning the candle from both ends? If so, what are they doing?